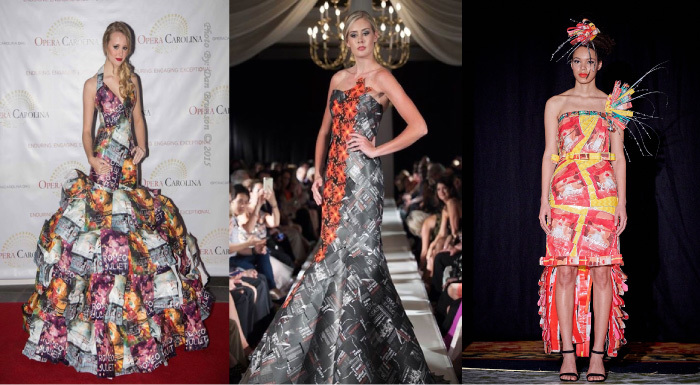 Opera Recycles puts outdated printed marketing collateral to beautiful and creative use as couture fashion pieces. More than 36,000 pieces of marketing material have been diverted from the landfill, demonstrating a commitment to the environment and creative thinking. Opera Recycles champions designers in and near Charlotte: Lyndsee Hairston, Malou Tabada Cordery, Emily Kramer, Venie Toledo, Sarah Danee, Itala Flores, Rocio Llusca, and Edelweiss De Guzman. For 70 years, the fully professional Opera Carolina has served the region with excellence in Grand Opera performances and programs in schools and throughout the community.